Women in Data Science + March Meetup: GraphQL with Graphene + More Beginner Python! Beautiful is Better than Ugly: T-Shirts, Hoodies, and more! Don't Forget to Register for our 4th Annual Fundraiser / Soir&eacute;e! UniversalGiving is hiring senior front-end developers full-time and part-time!! 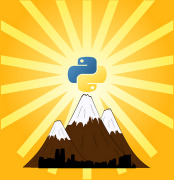 A Salt Lake City-based python web developer meetup. We are interested in promoting python development, but also welcome wisdom found in other programming languages. Avid and aspiring programmers alike are welcome to join us. We meet on the first Wednesday of each month (barring holidays, in which case we move to the 2nd Wednesday) at the INSCC building at the University of Utah.